I should begin by pointing out the contradiction inherent in the choice of theatre and disability as my subject. I am a non-disabled person, a walkie-talkie, a ‘tab’, the current disability movement term for us, the Temporarily Able Bodied. Like 70% of us all, it is likely that I will be disabled before I die, but, as yet, I am not disabled. I am indebted to Nabil Shaban, Mat Fraser and Jim McSharry, for changing the way I see the world. Now like all good converts, I am eager to spread the word. The afore-mentioned trio share a number of things in common, not least of which is the fact that from time to time their activities have attracted the attention of the British constabulary, because they are artists, they are political activists and they are disabled. As a theatre maker, I, like them, am driven by a search for truth and justice. This paper explores my journey of commitment to inclusive theatre. I came to the rather late realisation that, here in Scotland, more than 16% of the population were being denied their very basic human rights. That is to say, access to the basics of education, housing, employment, transport, entertainment and health care. I want to do something about this through theatre. As we all recently went to the polls, it was reported that, due to the physical inaccessibility of a number of polling booths, a number of disabled people were disenfranchised. Change ‘disabled’ to any other minority group and I suspect there would have been a significant outcry. Most of us have had the experience of going into hospital where we lose our identity. I have an eye disease and I suddenly find myself playing second fiddle to a pair of eye balls that I know are mine, but do not really have much to do with who I am. Then, the doctors make judgements about treatment based upon their relationship to these eyeballs, not my feelings, hopes or aspirations. We are obliged to feel grateful, but nonetheless we experience temporary disempowerment. Consider this from a disabled person’s perspective, where the balance of power between patient and doctor takes an extreme lurch in one direction. It is legal in Scotland for a doctor to withdraw life-sustaining food and drugs from a disabled person if in the doctor’s opinion that person’s life is no longer of ‘sufficient quality’ or that their continued existence would place an ‘intolerable burden upon their carers’. And they do make those decisions. Yet, how many doctors do you know well enough to entrust with the power of life and death over your life? How many doctors are trained in the ‘evaluation of the quality of life’? It is legal to sterilise a women forcibly on the basis of an opinion about the ‘capability of that person to be a mother ‘. While I support a woman’s right to choose, what does it say about us, when it is legal to abort a foetus up to full term, but only if it has a disability? On the radio, I regularly hear people discuss the brave new genetically screened tomorrow. What they are talking about is world into which disabled people are not born. Is that a better world? Such talk worries me because some of my heroes, like Rosa Luxembourg, were disabled. Gramsci was disabled. Stevie Wonder, Stephen Hawkins, Woody Guthrie, Beethoven – all disabled people and all making brilliant contributions, usually on the side of the least powerful. We, of course, should not romanticise, remembering Goebbels and Timur the Lame. But we cannot seriously say that the world would be a better place without people like them. The Nazis did and with horrifying precision enacted their vision. At Hadamar, 300,000 disabled children, women and men were led to the gas chambers, often taken by their parents, who had been convinced that they were doing them a favour by ending a worthless existence. People with cerebral palsy were also gassed, even though that is not a genetic defect, but an accident of birth which will not weaken the gene pool. It was their lack of ‘economic’ value that led to their inclusion. If we grant the right to terminate on the basis of disability, the right of a family not to have a disabled child, why not extend it to include the first moments after birth? Are we as a society capable of ensuring this does not happen? This is a real issue. The crimes committed by the Nazis against the disabled are still largely unrecognised, and the scientific project that they started continues. What has all this to do with theatre? Early in my career, in the 1980s I worked for 7:84 (England). We believed passionately that our theatre was part of a movement that was going to change the world, or at least the Labour movement . We were part of a theatre tradition that stretched back more than fifty years to the Workers Theatre Movement, to Unity Theatre, to Joe Corrie, one of Scotland’s finest playwrights, to Ewan McColl standing outside factory gates in Salford using theatre to persuade the working class to join the struggle for a fairer world, a world that granted them their rights. Joan Littlewood and he created the first Theatre Workshop. Drama is an exploration of conflict, with injustice at its heart. It is at its most effective when the consequences of the conflict resonate within our own lives. The ‘New British Theatre’ had possessed an instinct that drew it to those revealing arenas of conflict that opened up the way we saw the world, challenged our certainties and whetted our hunger for justice. In 1984, I produced a play for 7:84. called Six Men of Dorset, adapted by John McGrath from an original Unity Theatre play, encouraged to do so by the great Scottish actor, Alex McCrindle. It was a tribute to the six agricultural labourers who had 150 years earlier been deported for belonging to a trade union and for demanding the right to be treated as human beings. The play opened at the Crucible in Sheffield and played to packed houses of striking miners and their families. They rose as one every night to applaud an act of solidarity that reinforced their sense of self-worth, dignity and historical significance. The following year we staged The Garden of England, a tribute to the heroic struggle of the miners’ wives, but that was the end of 7:84 (England). Arts Council funding was withdrawn and, after the demise of 7:84 (England), where was I, as a committed and obsessive theatre maker, to find inspiration? By a complete chance, I met Nabil Shaban on a ferry, as we were both heading for Ireland. The last time we met we had been occupying the offices of the GLC leader Ken Livingston. Not for Nabil board room politics. His sense of political action had, for example, led him to remove himself from his wheelchair on the steps of the South African embassy and pour red paint over himself in protest of the apartheid regime. At another time, although highly popular through his appearances in Dr Who, he led a challenge to Granada TV’s refusal in 1988 to cast him as the main character of a children’s programme, Microman, on the sole criterion that they thought he would frighten children. Our chance meeting led to a joint project involving the disability movement. Here was real injustice. These people challenged, once again, at the most fundamental of levels, the way I saw the world. Theatre with regard to disability provided oxygen again, theatre that matters, theatre that is passionate, theatre that is important, theatre that can change the world. Yet, I was told that this work was therapy, not art. I was asked what could disabled actors have to say that was relevant. I was informed that this work was not art, not really even political. In the light of this, it might seem naive of me to have expected collaboration with disabled artists to be taken seriously, but I needed to know. The disability movement has developed a challenging analysis. For me, it led to a journey that helped me to understand that the act of placing my penny in the wee cripple boy outside Woolworth’s was an act of oppression, not solidarity. Theatre has been stimulated and strengthened by its engagement with class, cultural and sexual politics. Racism, sexism and homophobia in unconscious forms are now largely absent from our stage. I would now argue that it is time for theatre to engage fully with disability. Until, however, disabled actors are present on stage and in the rehearsal room, this engagement will remain superficial. The challenge is not only political, but also aesthetic. It is the inability of our imaginations to conceive of the range of potentialities of disabled people that is the greatest block to their employment as performers. Only by engaging directly with them in the creative process will these barriers be overcome. How is the wider public to conceive of the limitless possibilities of disabled people, if artists, charged with the stewardship of the collective imagination, cannot themselves conceive it? Many disabled people lead independent, rich and complex lives. It is untypical and remiss that theatre does not yet reflect this in its own employment practices and in its portrayals on the stage. For two years, from1996 until 1998 we worked on a production called d.a.r.e. The process of working closely with four disabled actors (Nabil Shaban, Jim McSharry, John Holywood and Daryl Beeton) and consulting with the wider disability movement transformed Theatre Workshop. We asked the Scottish Arts Council if Theatre Workshop could be funded to be a full-time inclusive theatre company and were told there were not any, or at least not enough, disabled actors to justify it. We asked professional directors from the producing companies and houses why they were not employing disabled actors and were told they were not good, versatile or experienced enough. We asked the providers of professional training why they weren’t training disabled actors. We were told that they were judged by results, that is, how many of their graduates are employed as professional actors, and that, as disabled actors are currently not likely to get work in the professional theatre, it would be unkind to mislead. Our response has been to develop a scheme that, over three years, aims to address these barriers. In consultation with the disability movement and the professional theatre and with the support of the National Lottery, we aim to provide professional experience and professional development opportunities to fifteen disabled actors over a three year period. We do this with the hope that producing companies and theatres in Scotland will commit to employing disabled actors, and that the drama trainers take up their responsibilities to include disabled people in their training programmes. To achieve this we need support. Nabil once said to me nothing will change for disabled people until it is in the interest of able-bodied people. What I hope this paper has indicated is that I believe that it is not only in the interest of disabled people that their human rights are granted, but in the interest of the theatre itself to engage with disability. I would go further and say that they are launching a lifeboat for us, a way to re-engage with our own sense of self worth and dignity. In recognising the dignity in disabled people, we may once again be able to recognise the dignity in ourselves. When recently working with a group of young anorexic women in a local hospital, it struck me quite how far the body has become the political arena of our time. It is because disabled people in the wonderful diversity of their physicalities and movement so disrupt our sense of aesthetic that they are the true warriors for our time. For society to become comfortable with the disabled body, it must become comfortable with its own sense of vulnerable humanity, and, just maybe, once again passionate about the condition of all humanity, even those that exist outside its own living rooms. The key to Theatre Workshop’s endurance has been its ability to change and respond to the world around it. It has done this by supporting the vision of its Artistic Directors. Theatre Workshop has been many things, a children’s theatre, a community arts venue, a touring theatre company, a receiving arts venue. Each of those incarnations has brought supporters and detractors. Theatre Workshop has ambitious plans to extend the boundaries of this understanding, but there are many people, who having already come into direct contact with us, now understand our mission and support our purpose. At the heart of our mission is the desire to make social inclusion a practical reality. We are realistic about our resources and set ourselves specific goals. With additional resources we could include more, but we should be judged by whom we have included rather than by those we have been unable to reach. Our point of departure on any project is dialogue with the ‘excluded’ group. By ‘excluded’, we mean those people against whom society places barriers to participation because of their culture, impairment, sexuality, gender or class. This objective applies both to specific projects and to our broader strategic ambition of being an inclusive producing theatre. In December 2000, for example, we worked closely with the much respected Traveller story teller, Stanley Robertson, to present his tale Jack in the Land of Dreams to thousands of school children. Not only did they hear authentic ancient traveller story and song, but they heard it told in a unique, and sadly dying, language, the Traveller’s Cant, a rich and lyrical mix of Gaelic, Doric, Scots and English. The fact that the show was presented by an inclusive cast of disabled and non-disabled actors clearly enhanced the richness of the experience. The inclusive company initiative emanated directly from listening to and acting upon the demands of disabled people for the granting of their human rights, the right to participate fully in our culture. The reasons for their exclusion are varied and complex, but the keenest analysis is contained within the Social Model of Disability. Understanding the Social Model requires a fundamental and at times challenging journey toward an understanding that the word ‘disability’ applies to the attitudinal, physical and institutional barriers that we, society, place in front of people with impairments. The Social Model’s opposite, the Medical Model, seeks to place the impairment at the centre and the individual as someone to be treated or cured: we are encouraged to take pity upon all those who suffer the consequences of impairment. The implications of adopting the Social Model are profound: it challenges many of the charitable constructs by which we define are own sense of ‘goodness’. It demands that we recognise the full humanity of disabled people with all the same capacities to desire, to dream, to achieve, and to fail as any other human being. The desire that disabled actors articulated to me was to be included in mainstream theatre. I would go further and say that such inclusiveness and diversity is not only acceptable; it is desirable and essential. Let us be clear. The consequences of the adoption of the Social Model of Disability are difficult. They are upsetting to many people. Undoubtedly disabled performers have benefited from the mutual solidarity and support of working in ‘disabled only’ companies. This, however, is more of a comment about the lack of support and solidarity that is available elsewhere. While recognising the quality of some of the work and their importance to the development of disabled performers, they are theatre’s equivalent of the ‘sheltered workshop’ or ‘special provision’. Their very existence reinforces the Medical, or Charitable, Model. Sometimes the work of these companies falls below professional standards, and sometimes they create a relationship of dependency between the performers and company that has more in common with social service provision than it does with the cut and thrust of a professional theatre company. Theatre must acknowledge its active role in the construction of the disabling world. 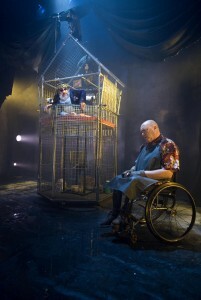 Whenever a playwright uses the metaphor of ‘crippled’ body for ‘crippled’ soul, a director uses an image of disability to signify terror, or an able-bodied actor employs a gesture from the vocabulary of impairment to evoke pity, the corrosive mixture of fear and pity that pervades the public conception of disability is unthinkingly reinforced. Nabil Shaban has observed: ‘The entertainment industry sits at the top of a pyramid of body fascism and only a few brave projects dare to challenge the script.’1 Our aim must be the full integration of disabled actors into the broad spectrum of theatre, as it is only then that their automatic low status will be overcome. This is where the Theatre Workshop inclusive company project is so important. Many new developments are taking place. Our actors completed in June 2001, for example, a two week course in television and radio with Queen Margaret University College Acting students. In July 2001, our first group of actors came to the end of its first year and auditions for another five to join them, from an increasingly large number of applicants, took place. In Scotland, through a coincidence of personalities and opportunities and with the support of the SAC Lottery Fund, Theatre Workshop has established the very first professional inclusive producing theatre. I hope it will change the face of Scottish theatre – and eventually all theatre – but it will take time. It would be profoundly unrealistic to expect that a hundred years of discrimination will be undone in three years, let alone in the first twelve months of such a project. However the lessons and the experiences of these first twelve months have been extraordinary and we have begun to address directly some of the barriers disabled people face in their aspiration to be employed as professional disabled actors. We plan to share our new understandings with the rest of Scottish theatre soon, but be assured, our experience would suggest that Scottish theatre has nothing to fear and masses to gain.